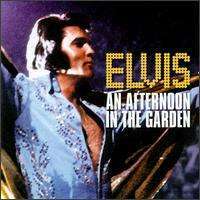 An Afternoon in the Garden is a compact disc recording of a live show presented by Elvis Presley at Madison Square Garden on June 10, 1972, released in 1997, RCA 67457-2. During the weekend of June 9 through June 11, 1972, Elvis Presley gave his very first concerts in New York City; he had performed on television in the 1950s and recorded at studios in the city, but had never performed in a concert venue before a paying audience. Four shows in total were scheduled: three for the evenings of Friday, Saturday, and Sunday, with a matinee performance on Saturday afternoon as well. Engineers from RCA Records taped the two Saturday concerts, the results of the evening show released a mere eight days later on Elvis: As Recorded At Madison Square Garden, while the tapes for the afternoon show stayed in the vaults until a few months before the twenty-fifth anniversary of the concerts. The track "I Can't Stop Loving You" had been released previously in 1977 as the sole unissued track on Welcome to My World, and the tracks "Reconsider Baby" and "I'll Remember You" had been previously released on disc five of the seventies box set. ↑ Dutch Charts - An afternoon in the Garden Archived January 30, 2016, at the Wayback Machine.